Available in 9 standard colors, with 4 colors available for exterior use. 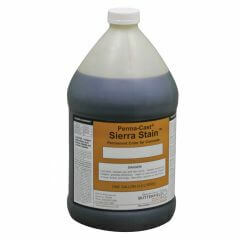 A concentrated penetrating reactive stain that chemically combines with cured concrete to produce permanent, variegated coloring effects. Packaged in 1-gallon (3.8 L) bottles of concentrate, with recommended application diluted with one gallon of water. At diluted strength coverage is approximately 200-300 square feet per gallon, but varies with surface conditions. A second application is recommended. Wide color variations, mottling, and unevenness of the color is normal and to be expected.